Looking for a job? How do you feel about Mexican food? Business is booming at Miguel’s Jr., which has been rolling out its new breakfast menu to its 14 Inland Empire and Orange County locations,and the company is looking to hire 100 full- and part-time employees. 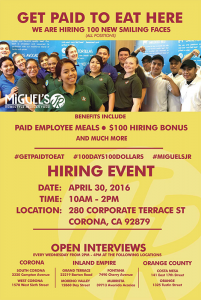 The chain will hold a hiring event from 10 a.m. to 2 p.m. Saturday (April 30) at its corporate headquarters, 280 Corporate Terrace St., Corona. West Corona: 1570 W 6th St.
South Corona: 2320 Compton Ave.
Moreno Valley: 12860 Day St.
Costa Mesa: 141 E. 17th St. It doesn’t seem to be your typical fast food job, either. 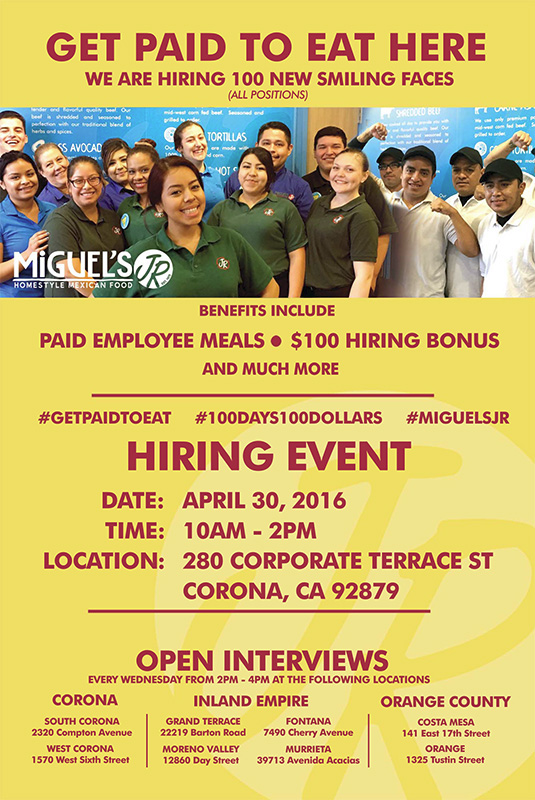 As an incentive to find qualified candidates, Miguel’s Jr. is offering a $100 signing bonus to all new employees after their first 100 days on the job. Other benefits and perks include a referral bonus program, free employee meals, medical, dental and vision insurance, 401K plan, paid time off, company-sponsored recognition programs and more, depending on eligibility. Heck, I’d work there just for the free meals, but…I already have a job. This entry was posted in Mexican by John Plessel. Bookmark the permalink.